By Emil Cherrington, CATHALAC, and Dan Irwin, NASA. A recent study conducted in the context of SERVIR demonstrates the utility of Earth observation technologies for monitoring the forest resources of Belize. The Regional Visualization & Monitoring System (SERVIR) is a joint initiative of the regional organizations CATHALAC, RCMRD, and ICIMOD and is supported by the US Agency for International Development (USAID) and NASA. Recognized in 2007 as one of the “100 steps toward the Global Earth Observation System of Systems (GEOSS),” it has provided key decision-support information for monitoring the land surface, oceans, and atmosphere of regions such as Mesoamerica and the Caribbean, Africa, and, soon, the Himalayas. With an increased global focus on the capacity of the world’s forests to mitigate climate change, one relevant recent development from SERVIR has been the completion of a 30-year study of forest cover change and deforestation in Belize, a GEO Member and Central America’s northernmost nation. 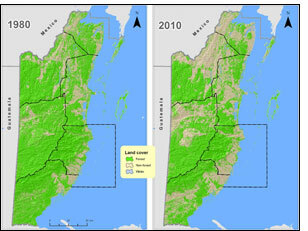 That study, “Forest Cover and Deforestation in Belize: 1980-2010,” was done at the request of the Government of Belize’s Ministry of Natural Resources and the Environment, the federal entity responsible for managing forests and public lands in the nation recognized as having the highest percentage of forest cover in Mesoamerica. The Ministry of Natural Resources and the Environment is also the focal point for GEO. Based on analysis of imagery for 1980, 1989, 1994, 2000, 2004, and 2010 from the Landsat series of satellites managed by NASA and the US Geological Survey, the validated, national-level assessment indicates that Belize’s forest cover has declined from 75.9% in 1980 to 62.7% as of late February 2010. Average annual deforestation was estimated at 0.6%, equaling the clearing of almost 10,000 hectares of forest per year. Of particular significance is the study’s illustrating that protected areas have been extremely effective in conserving forests, with only a small percent of forests within protected areas being detected as cleared within the past 30 years, compared to a quarter of forests outside of protected areas being cleared in that period. The assessment also fills an important information gap, since the only previous evaluation of deforestation in Belize was a 1996 USAID-funded study. The study demonstrates SERVIR’s capacities for rapidly converting satellite data into information and holds lessons for the ongoing implementation of GEOSS. While this assessment utilized an exhaustive 27 gigabytes of imagery and intermediate outputs which required significant computational resources, the entire study was completed in just four months, including the analysis of pre-collected field data to “ground truth” the outputs. It is also the first time in Belize’s history that such an assessment has been completed in the same year the imagery was acquired. Similar studies conducted in neighboring countries have generally taken over a year to conduct and have not covered as broad a timescale as the 30-year, six time-step study completed for Belize. The study’s technical report fully elaborates the methodology used, as well as providing access to the “spectral signature” libraries developed which would facilitate extending the study. The study has many synergies with the ongoing Forest Carbon Tracking Task work being coordinated by GEO. Where GEO is calling for the development of a Global Forest Observations Initiative, it is noted that Belize, like many other countries, needs sustained long-term monitoring of its forests, an activity in which GEO can play a key role. The Belize assessment has also had regional implications for GEOSS-related activities. Shortly after the study’s completion in early August, it was presented to a meeting of the regional technical committee on biodiversity established in the context of the Central American Integration System (SICA) and was well received by the meeting’s representatives. Those representatives likewise indicated the need for similar national-level studies to be conducted in their own countries. This work complements a European Commission-funded study by CATHALAC of land cover change across all of Central America. Representatives of the Government of Belize have expressed interest in using this study as an input to international reporting for a range of commitments ranging from the United Nations Millennium Development Goals to the emerging Reducing Emissions from Deforestation & Forest Degradation (REDD+) initiative. Making use of the TROPICARMS 2.0 system implemented by CATHALAC, the report also estimates Belize’s current stock of forest carbon – an important requirement of REDD+.